Good morning to all the writers out there! I’m so excited to announce THE INSPIRATION PROJECT – a very special project I’ve been working on with my wonderful friends and all-round amazing women, Catherine Howard and Carmel Harrington. 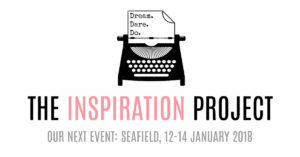 The Inspiration Project is a writing retreat with a difference which aims to inspire, support and encourage writers to fulfil their writing dreams, whatever stage they are at. If you don’t know where to start, don’t know what to do now that you’ve reached ‘THE END’, or even if you already have a book deal but don’t know what to do next, we’re here to help, and inspire. As very busy women, we know how difficult it can be to find time to write and think without distraction, so The Inspiration Project is all about providing an opportunity for writers to check out of everyday life and check in with their writing, and to do so in an environment where they can think big and dream even bigger. A lot can happen in 48 hours, and we’ve devised a programme that makes every minute count before our participants return to their busy lives. 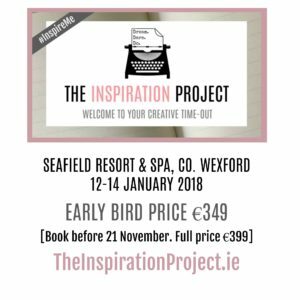 For all the details, visit our very shiny and pink new website at https://theinspirationproject.ie Our first event takes place on 12-14 January 2018 in Wexford, Ireland, and we are keeping the numbers small so places are limited. We really hope you love this concept as much as we do! Here’s to dreaming big!